Track A for the related fields. Track B for all other disciplines. 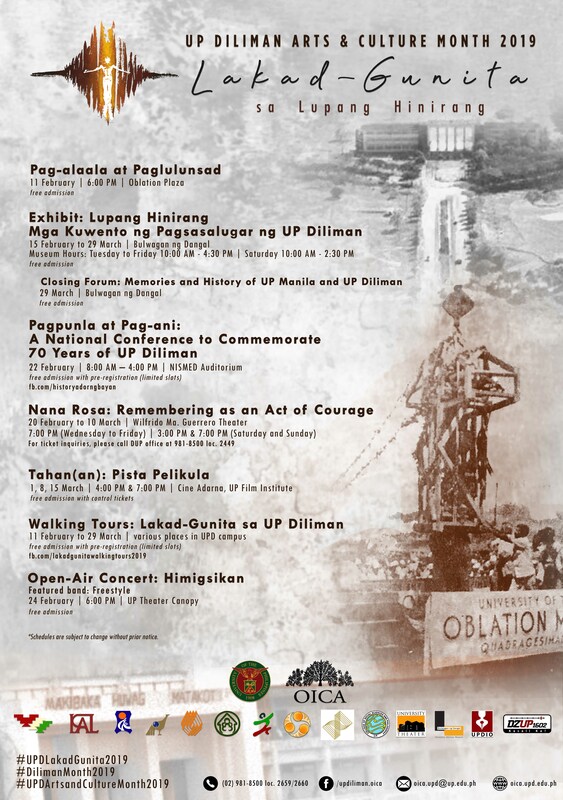 UP Diliman Office for Initiatives in Culture and the Arts (OICA) invites everyone to the celebration of UP DIliman Arts and Culture Month 2019 with the theme Lakad-Gunita sa Lupang Hinirang. Click here for program details. UP College of Architecture Alumni Homecoming 2018: New Building Good Old Memories on 24 November 2018 4pm onwards at Building 3 Lobby. Contact upca.alumni@gmail.com for details. The Guidelines to Facilitate Voluntary Contribution in the University of the Philippines is now available. Click here for details. Design + Discourse Volume 4 is now available. UPCA Class of 2016 (BS Arch and L Arch) get your complimentary copies at the UPCA Administration Office starting August 20, 2018. Look for Ms. Katty Navarro. Other volumes are now available at UP Press Bookstore. Click the link for details. UP College of Architecture joins architecture schools/departments of UP Mindanao, De La Salle University-College of St. Benilde, University of San Carlos and artist Yason Banal and NGO TAO-Pilipinas as exhibitors in the Philippine Pavilion at the Arsenale in Venice, Italy for the 16th International Exhibition Biennale Architettura 2018. The Philippine exhibition themed The City Who Had Two Navels is curated by Arch. Edson Cabalfin, an alumnus of UPCA. The exhibition is open from May 26 until November 25, 2018. Click here for details. Affirmation of the 8th Dean of the UP College of Architecture - Professor Armin B. Sarthou, Jr. last March 9, 2017 at the UPCA Amphitheater with the special attendance of newly reappointed UP Diliman Chancellor Michael L. Tan . The deanship was formally turned over by past Dean Mary Anne A. Espina in the presence of the UPCA alumni, guests, faculty, students and staff.